Can I Make Clothes Without a Pattern? A couple of years ago I started asking myself whether it was possible to make clothes without a pattern. Was it possible for somebody with no formal training to make something completely from scratch? Would it be enough to arm myself with my measurements and some bits of greaseproof paper? 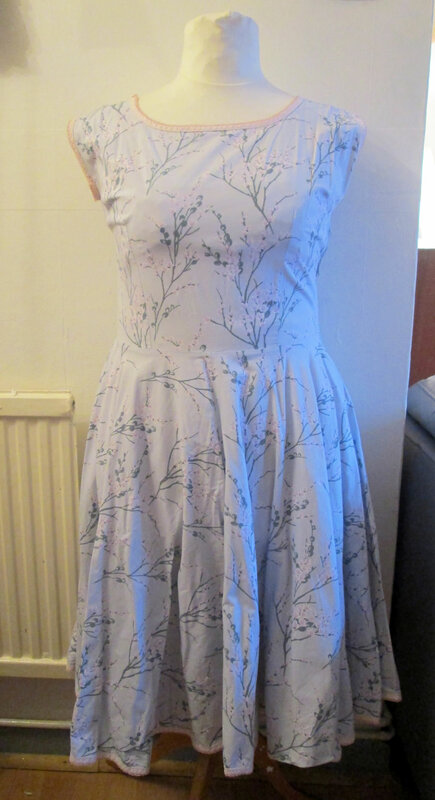 Or would it prove to be impossible, with only sewing disasters to show for my hard work? 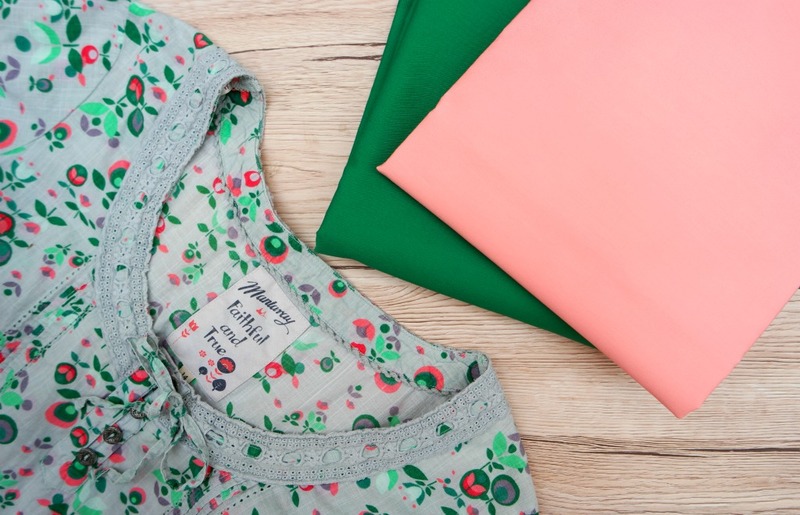 The short answer is yes, you can make clothes without a pattern! Why Make Clothes Without a Pattern? There are sometimes issues with using patterns. One of the problems is getting things to fit. The sizing on the back is totally different to high street dress sizes and although patterns can be adapted, it can be tricky and there’s no guarantee that you’ll end up with something that is a good fit. Often the instructions are confusing. There have been a number of times where I’ve got into a total muddle with the instructions, or not been able to figure out at all what I am supposed to do! I’ve ended up putting the instructions to one side (cough, throwing them across the room, cough) and finishing the thing off myself in the way I think best. Also, patterns rarely show the easiest way of doing things, even if there would be no obvious difference between doing something the easy way and doing it the proper way! On top of all of this, it all takes so long! Wading through the instructions, identifying the pattern pieces you need, ironing the pieces, laying them out, cutting out, reading the instructions again, getting into a muddle, it takes ages. And ages is not what most of us have. Making bags and cushions and things without a pattern is possible. So I decided to try making clothes without a pattern to see whether that was possible. And I am pleased to say that it is totally possible! You can end up with something that fits right, in a style you like, in less time and with less faffing about. The key thing here is to keep things simple. I should probably say at this point that if I was going to make something difficult or complicated, or something I hadn’t tried before, then I would probably use a pattern. It would give me a sense of how to go about making a similar thing without a pattern in the future. 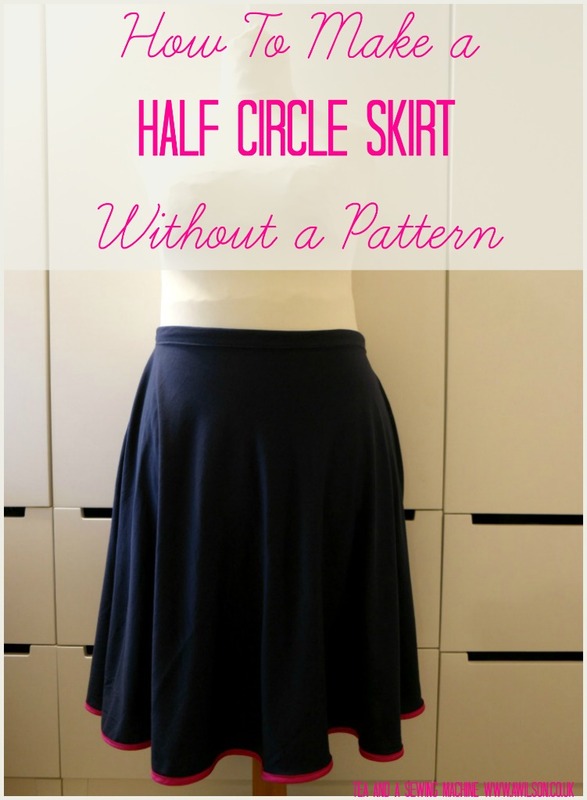 A good, simple project is a circle skirt. There’s a tutorial for one here. Loose fitting pyjama style trousers are also a good place to start, or you might like to try some of these. Do I Need Particular Skills or Knowledge? Making something without pattern requires using the skills and knowledge you have, plus your creativity. Keeping it simple here means being aware of and keeping within your own limitations when it comes to making clothes without a pattern. This doesn’t mean you have to stick to making things that are so easy they are completely shapeless! It just means being aware of what you can do and how you can use that knowledge to make something for yourself. Simple is best. It doesn’t have to mean shapeless. Do I Need Any Particular Equipment? 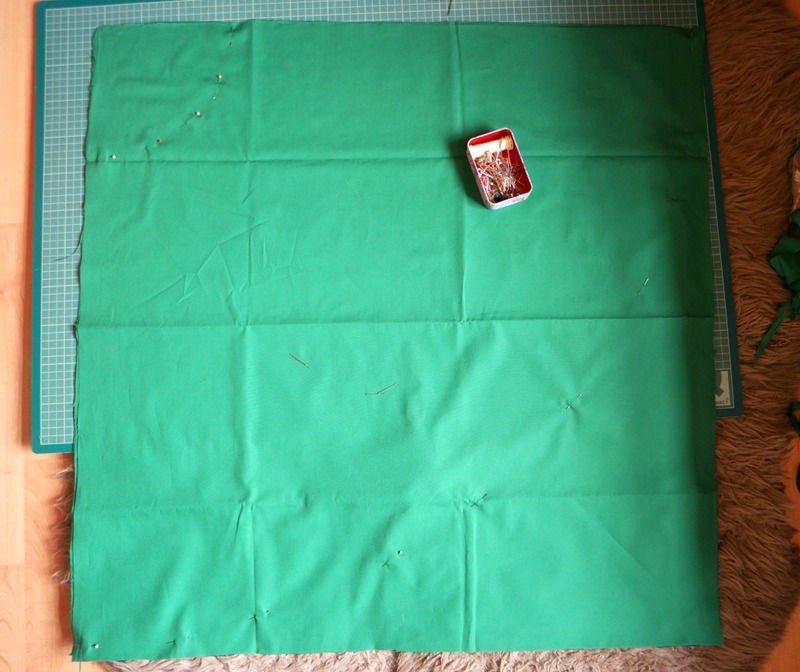 You’ll need your usual sewing supplies, including pins, tape measure and decent scissors . Large bits of old fabric are very useful. Try old curtains or old duvet covers. You’ll also need pattern paper , although greaseproof paper or newspaper will do. Swedish pattern paper is supposed to be very good as you can use it in the same way as ordinary pattern paper, but you can also sew it. I haven’t tried it myself though! A dress form is nice to have as it does make things easier, but it’s not essential. If you don’t have a dress form, a friend or a cooperative husband is useful. Where Else Can I Find Inspiration? The best place to look is your own wardrobe. Identify clothes that you like to wear and why. Then have a good look at it and try to figure out how it is put together. Look for the size and shape of the pieces, how the necklines been finished, and generally how the thing is constructed. If you can bear to, take it apart! Then try to make something similar. Keep it simple. I keep saying it because it’s important! Stick to simple shapes and simple construction and it will probably turn out fine. Don’t be afraid of darts. Darts give things shape where they need it. If the thing you have made is a bit shapeless, darts are probably the answer. Don’t be afraid of zips. Doing them the proper way is a fiddly nightmare, but there is a much easier way! Things go wrong sometimes. Our mistakes are an opportunity to learn. Most mistakes are fixable with a little bit of creativity. If you would like to know more about making clothes without using a pattern, I have a free ebook for you! Just fill in the form here with your email address and it will be sent to you. You might also like my ebook, Sewing Clothes Without a Pattern: 6 Easy Projects to Kickstart Your Handmade Wardrobe. 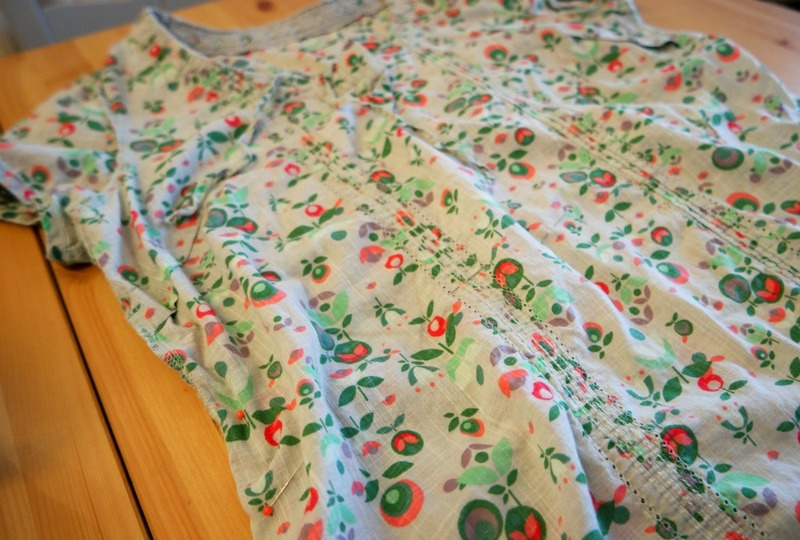 It contains 6 projects that you can make yourself without using a pattern, using a circle skirt as a starting point. There’s also a free printable for recording your measurements. 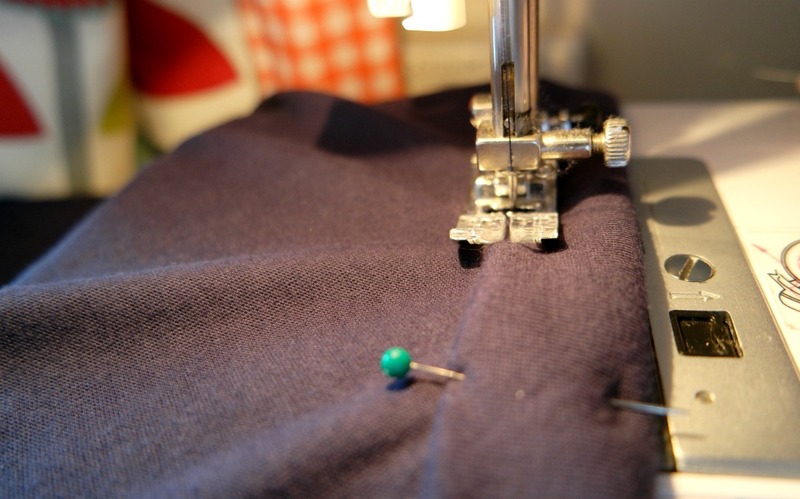 If you want to make clothes without a pattern, you might also find these posts helpful. They are very easy and quick to make and you don’t need a pattern. They suit pretty much every body shape and they are lovely and swirly to wear. The only downside is that you need a lot of fabric. While having a rummage for something the other week, I found a couple of metres of cotton jersey that I’d bought for something and never used. 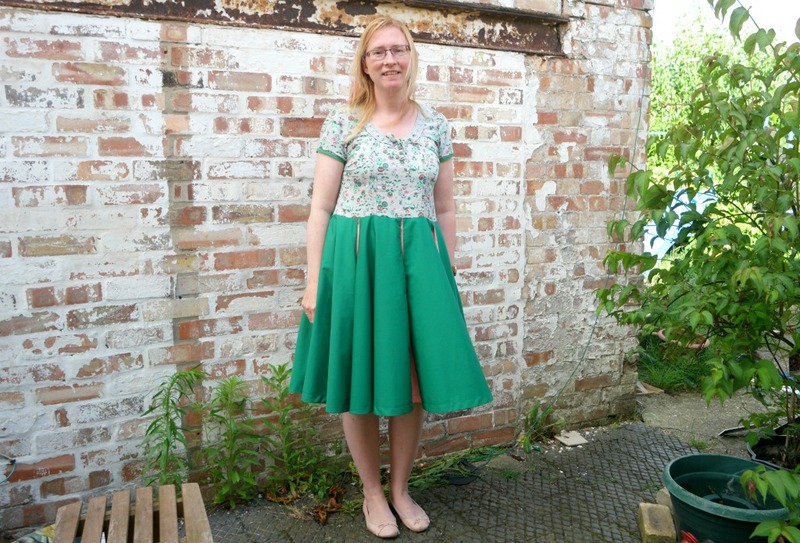 2 metres is not enough to make a circle skirt for somebody of my dimensions, but it’s plenty for making a half circle skirt! So that is what I did :). Being made from jersey, it didn’t need a zip. There was less of it to cut out and less of it to sew, so it was quicker to make. 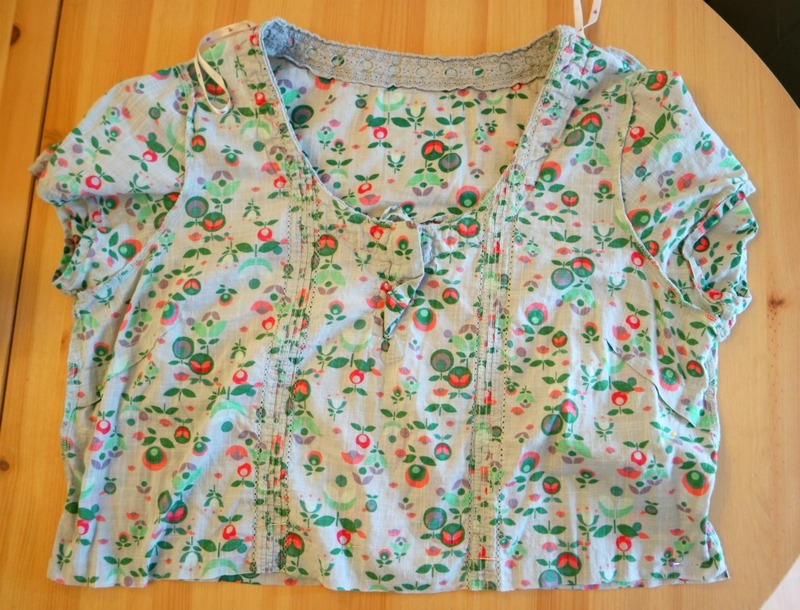 I used stretch bias binding to finish the hem (affiliate link). 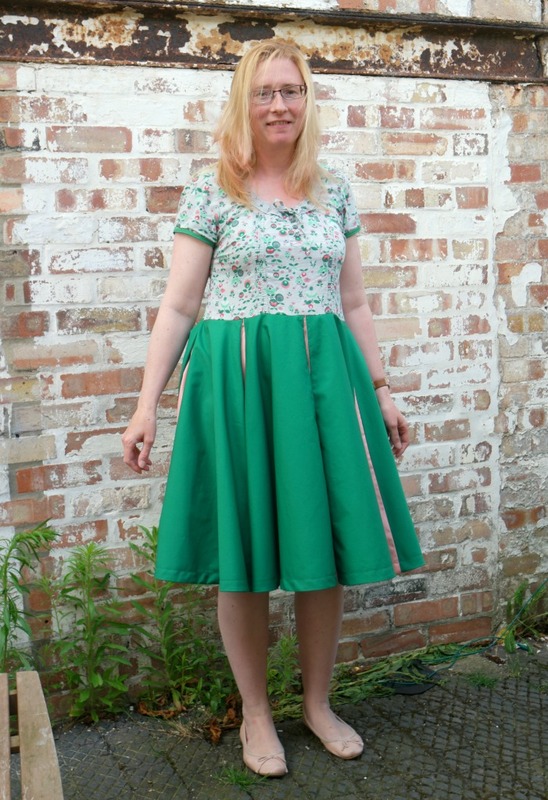 Bias binding is my favourite way to finish the hem of a circle or a half circle skirt as they can be fiddly to hem normally. I opted for a contrast colour instead of aiming for the same colour and it not being quite the same. It’s actually the pinkness at the bottom of the skirt that is my favourite thing about it! 2 metres of jersey fabric, 3 metres of stretch bias binding, usual sewing supplies, but check your measurements first! This involves doing some maths but please don’t panic if maths is not your thing! It’s not difficult maths. Decide how long you want the skirt to be. 60 cm is a good length for most people. 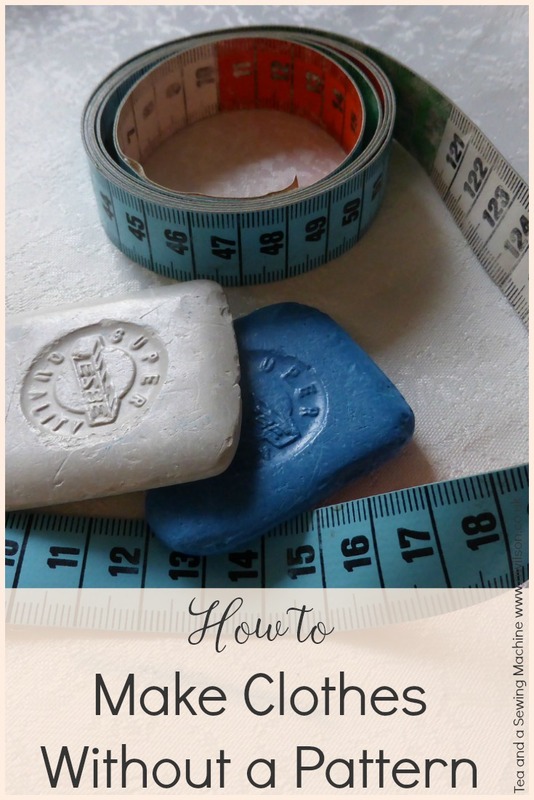 Measure around your waist and add 4 cm. 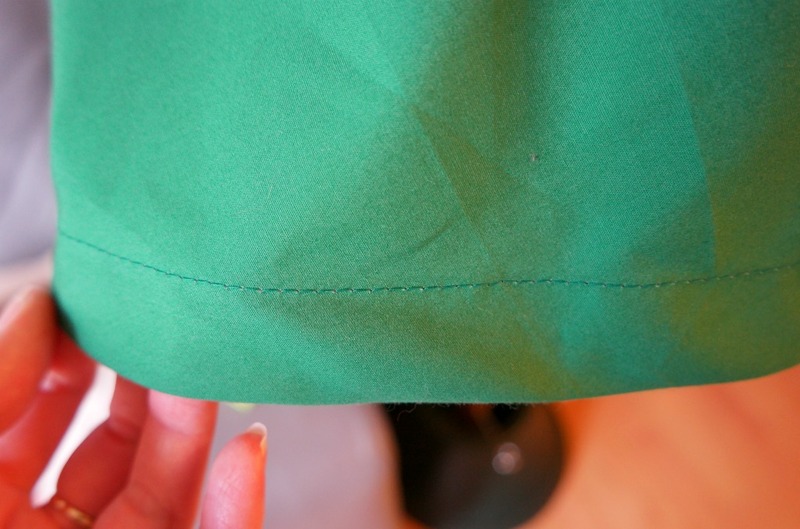 This is to allow for a 1 cm seam. Take that number and divide by 3.14, or pi. There’ll be a pi button on your calculator, and probably a calculator on your phone if you don’t have one. Or you could just divide by 3.14. Add the answer to the length of the skirt. This is the size of square you will need. So my waist measurement plus 4 extra cm was 97 cm. Divided by pi, this was roughly 31 cm. I added 31 cm to 60 cm, giving me 91 cm. So I needed to cut 2 squares of fabric 91 cm x 91 cm. That’s the hardest part, the rest is easy! 1. Take your 2 squares of fabric and lay them out wrong sides together. If you are using a directional print, make sure that both squares are the same way up. 2. Remember the number you ended up with after you divided your waist measurement? Take that number and measure down from the top of the squares by that amount. 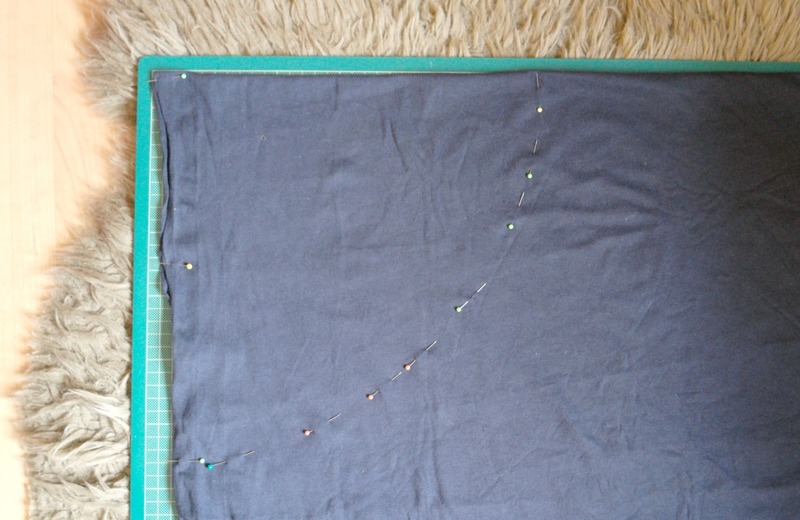 Pin, then using a tape measure, measure all the way round the top quarter. Mark with pins. My advice is always to iron your fabric first. As you can see, I need to take my own advice! 3. 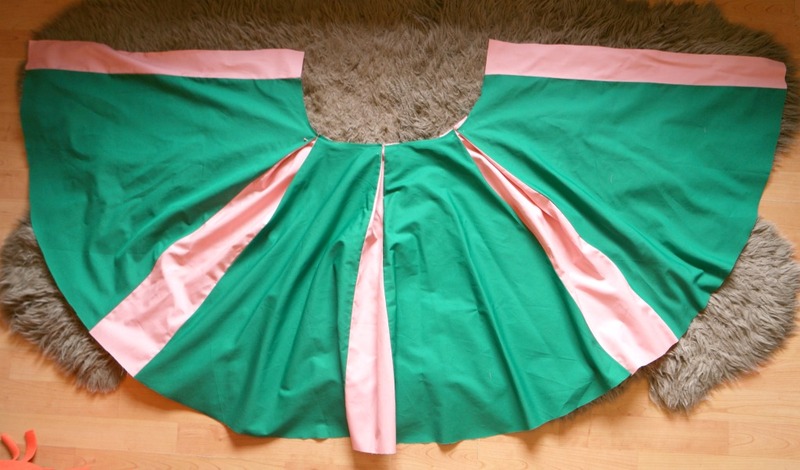 Now take that number added to the skirt length and measure down from the top corner. Mark at the side with a pin, then measure all the way across the bottom of the corner circle. 4. Cut where you have pinned. You should end up with 2 pieces that look like a quarter of a doughnut. 5. 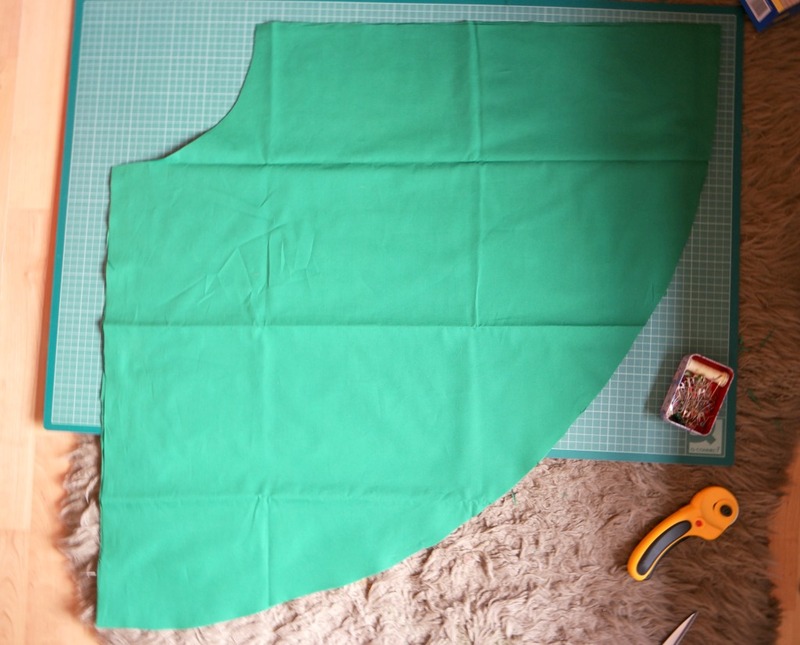 From the fabric that is left, cut a strip of fabric 10 cm wide and as long as your waist measurement plus the extra cm. It might be necessary to cut 2 strips. 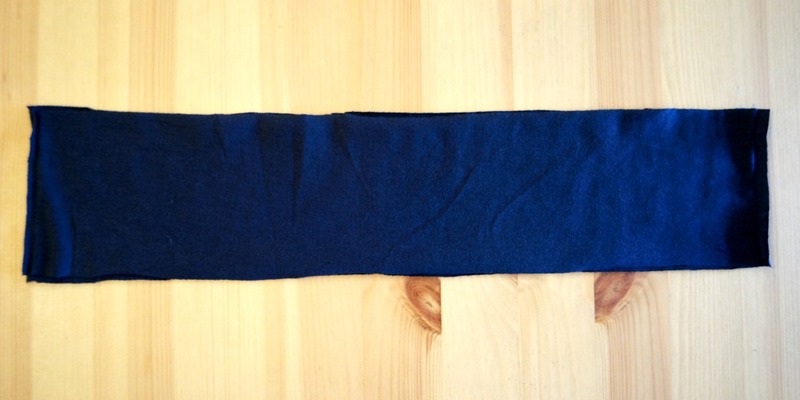 You’ll need the waistband to stretch, so check that the grain is running up and down the waistband, not side to side. 1. 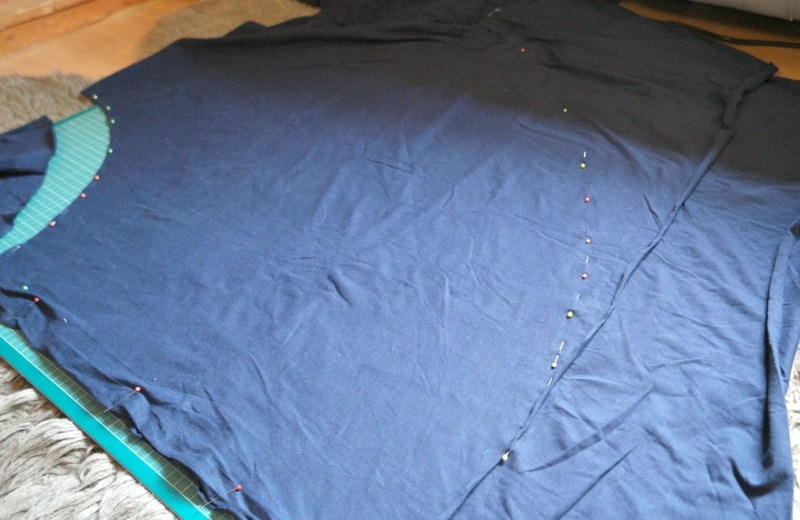 Take your 2 quarter circles and, with the right sides together, pin the side seams. Try it on to check that it fits. Adjust the pins if necessary. 2. Sew up the side seams. 3. 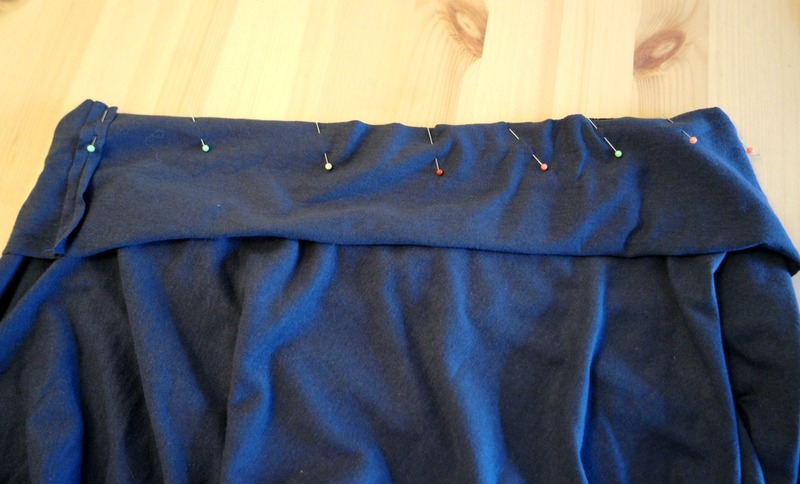 Take the waistband strips and pin them together. 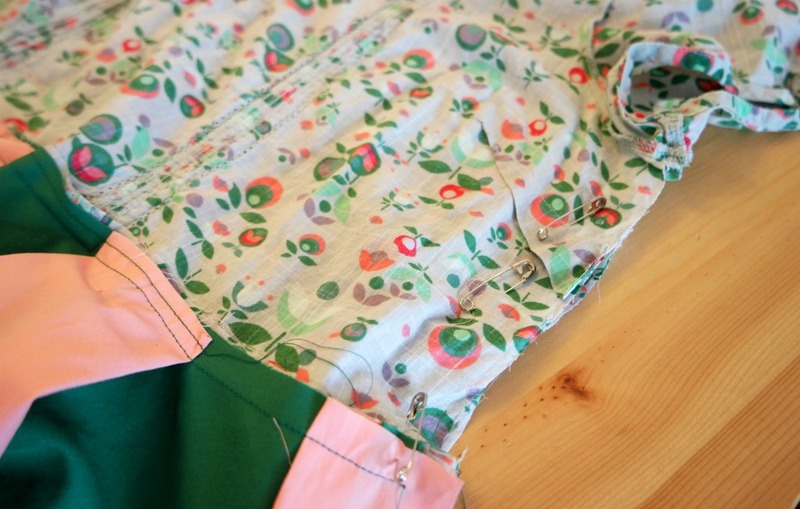 Check them against the skirt to ensure that the seams will match, then sew the waistband pieces together. 4. 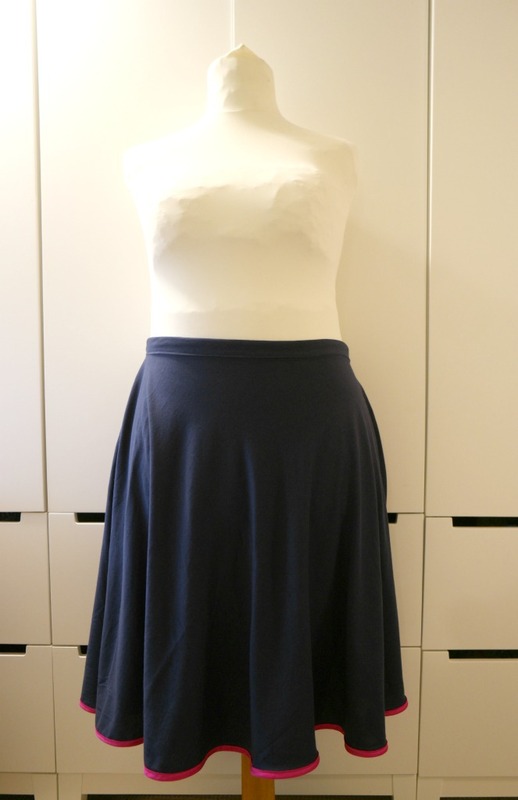 With the waistband wrong side up, pin it to the wrong side of the skirt. 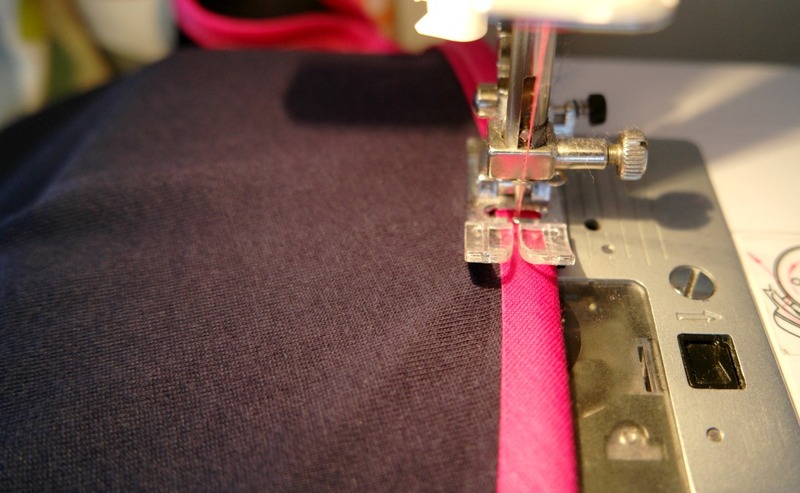 Start by matching the side seams. 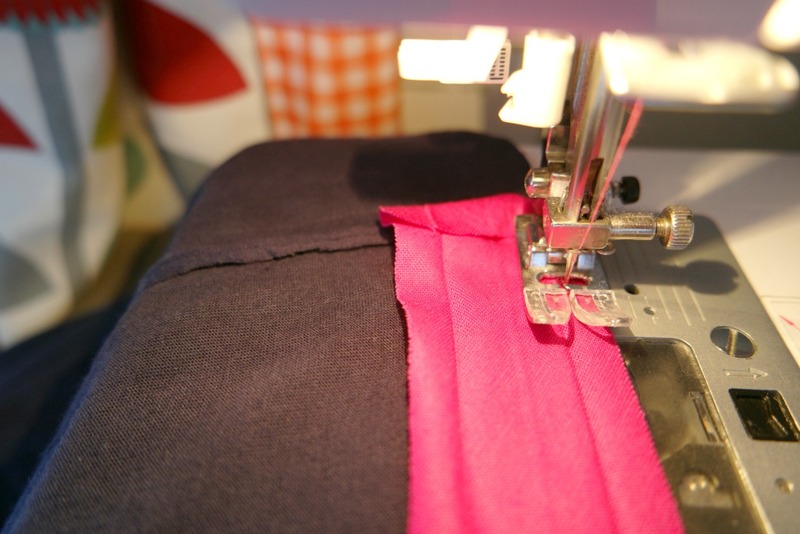 Sew the waistband to the wrong side of the skirt. 5. 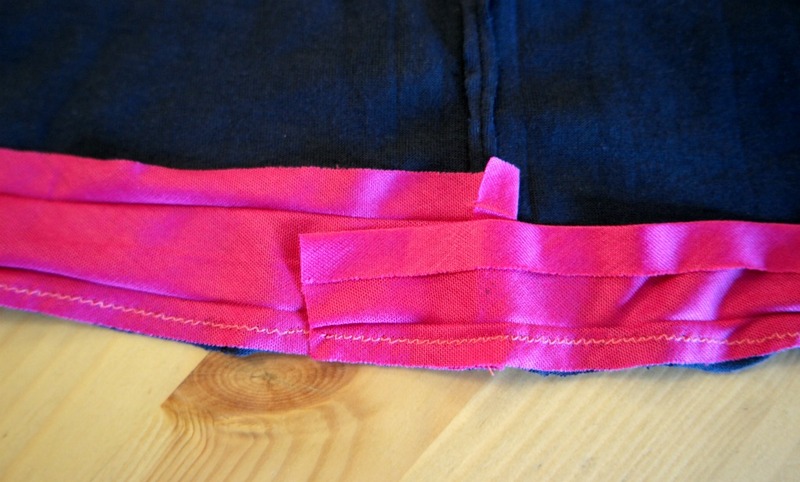 Fold the waistband over the top of the skirt. 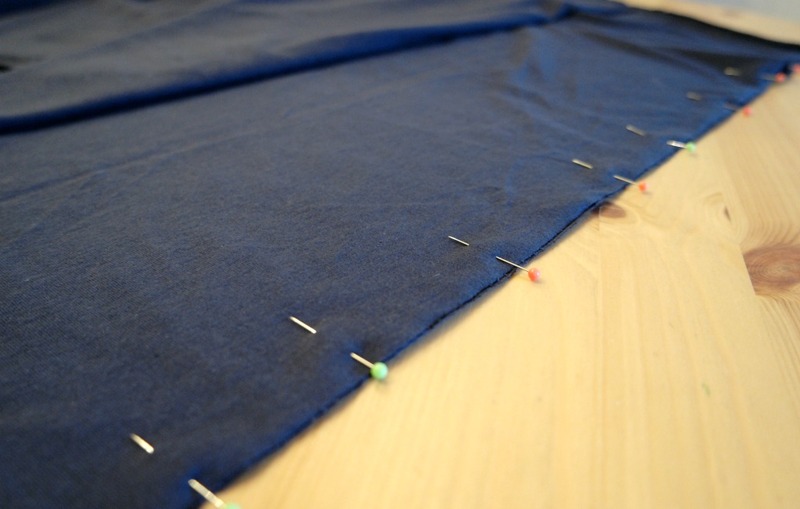 Tuck the raw edge of the waistband underneath and pin it to the top of the skirt. 6. 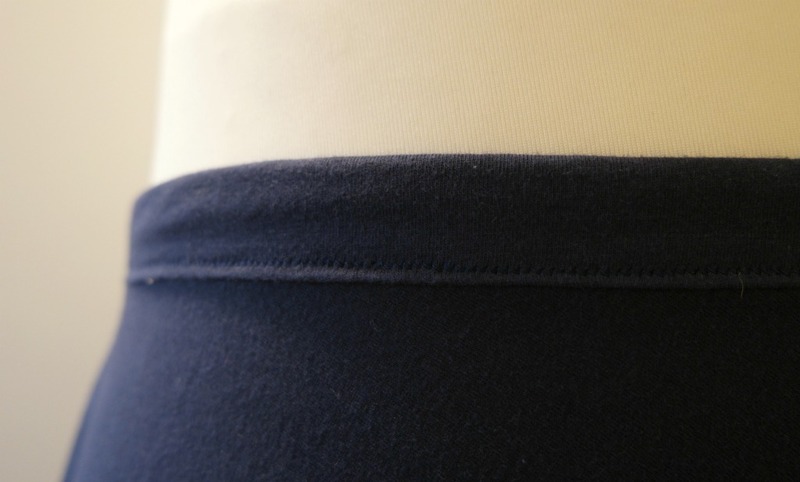 Top stitch around the waistband, keeping close to the bottom edge. 7. Starting at one of the side seams, fold one end of the bias binding over and pin it to the bottom of the skirt on the wrong side. 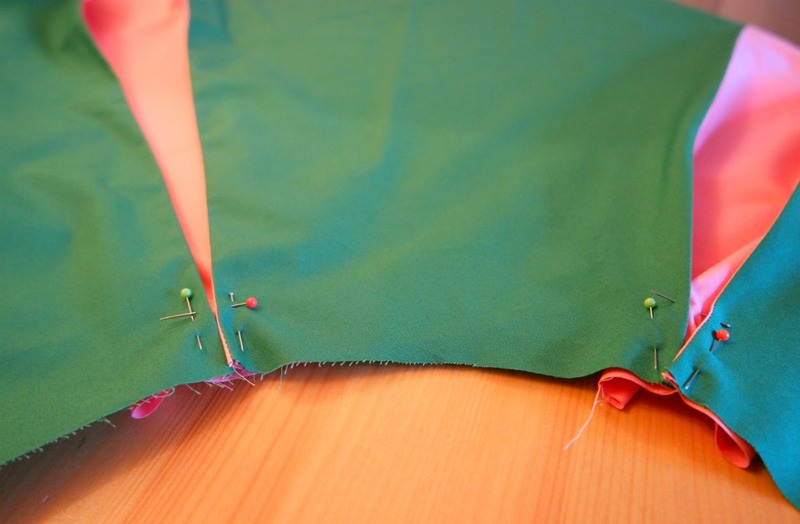 Sew the bias binding all around the bottom of the skirt. 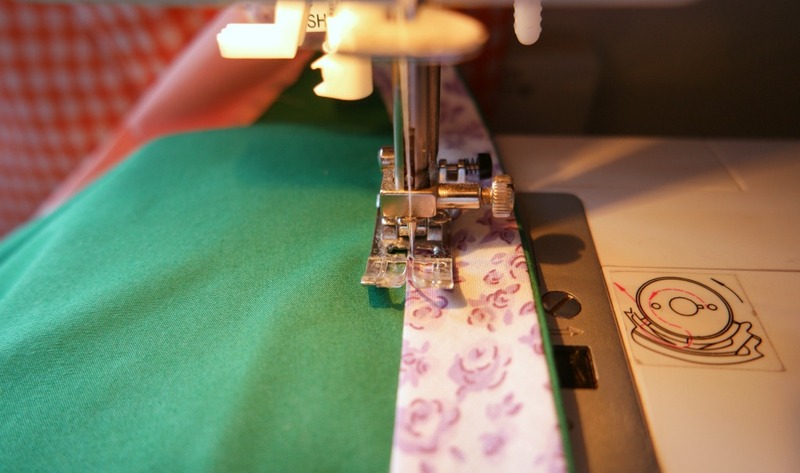 When you get back to where you started, overlap the bias binding by a cm or 2. Sew it in place and cut off the rest. 8. 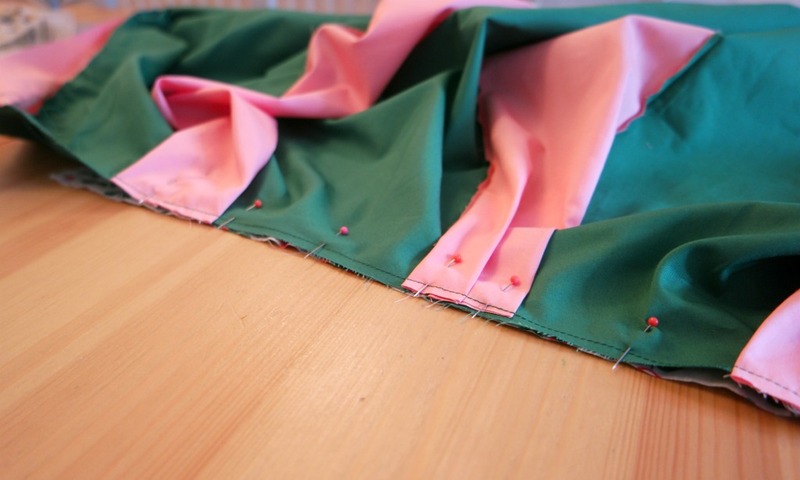 Fold the bias binding over bottom edge of the skirt, tucking the raw edge of the bias binding inwards. Top stitch all the way round. 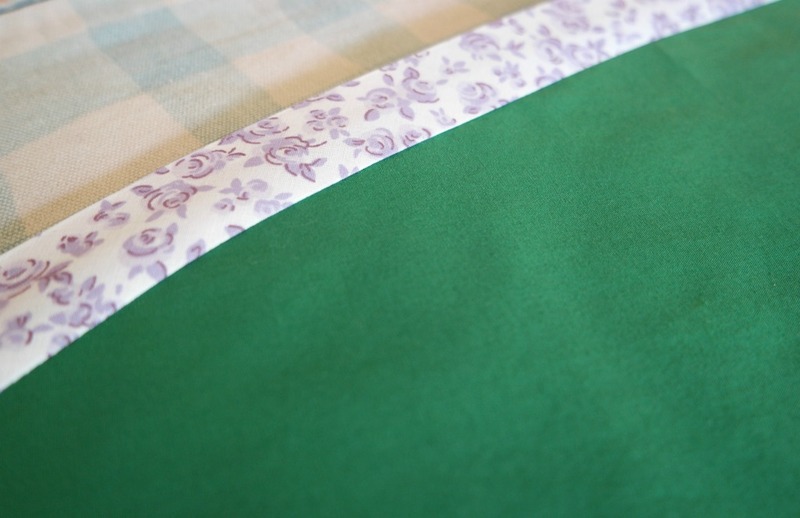 When you get back to the start, carefully fold the ends of the bias binding over and sew in place. 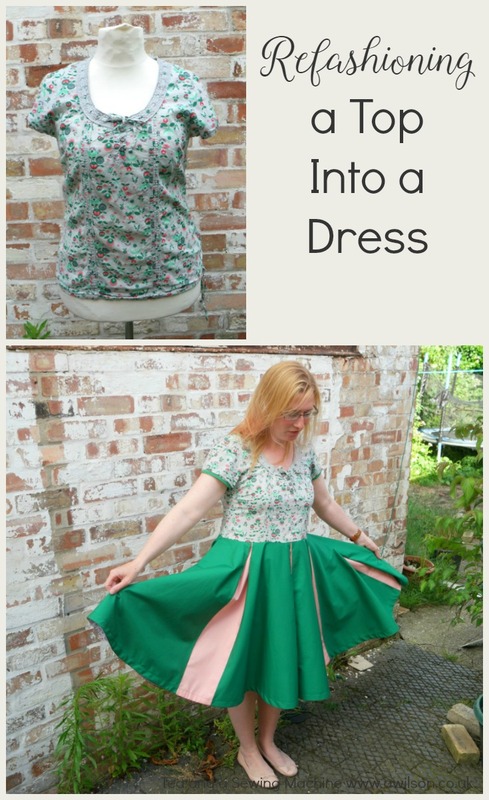 You might also like to take a look at my ebook Making Clothes Without a Pattern: 6 Easy Projects to Kickstart Your Handmade Wardrobe. 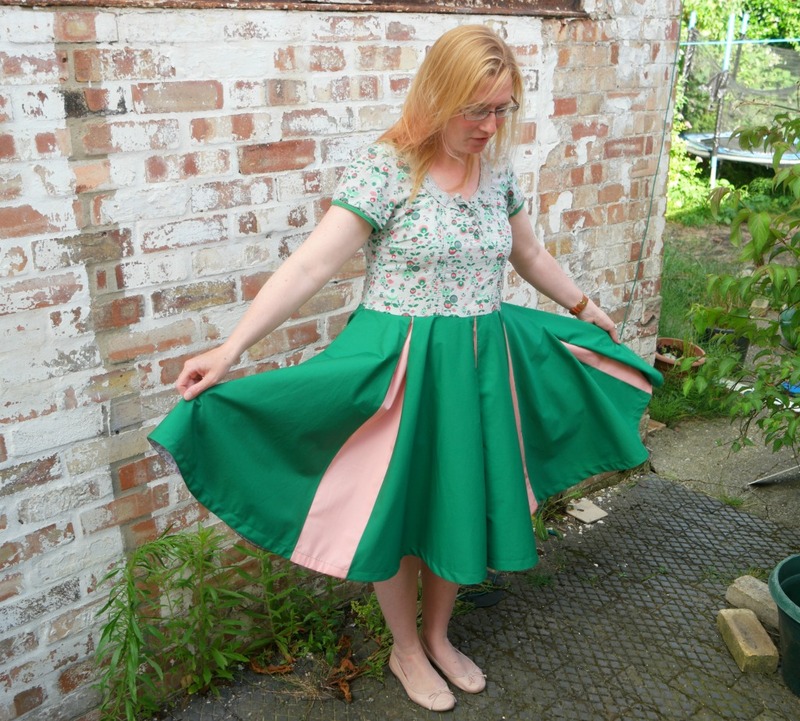 You can also sign up to receive updates and free stuff and you’ll be sent a printable copy of the circle skirt tutorial, complete with a page to record your measurements! There’s a form below. 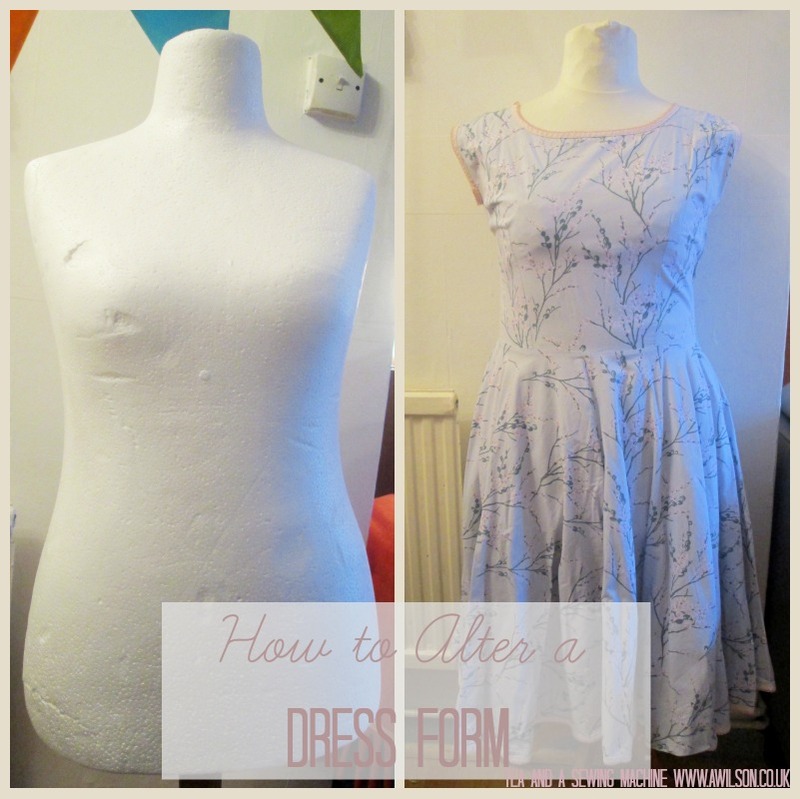 Having a dress form or tailors’ dummy can make making your own clothes so much easier. It’s very difficult pinning things to your back and then drawing on yourself with a pen! 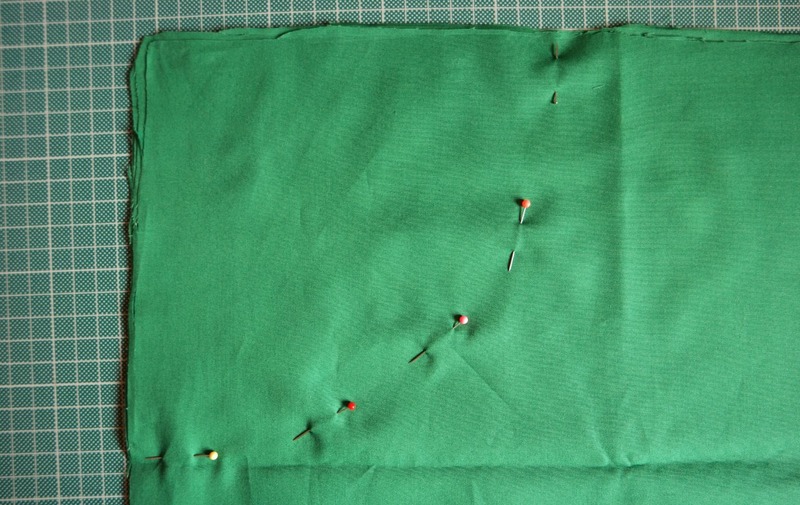 It’s equally difficult trying to pin a hem and check that it’s straight. They’re not so useful if they are not the same size as you! This is when you might need to alter a dress form. The best kind of tailors’ dummy is the adjustable sort . These are more expensive than the kind that are a fixed size . The fixed sized ones, although cheaper, can be where you can run into problems. My dress form, known as Betty, has never been a great match size wise and this has resulted in some slightly peculiar results. Living in quite a small house as we do, there is no room for large items of clutter, which Betty has unfortunately become. Get rid of Betty (I feel bad doing this as she was a Christmas present a few years ago). Fix Betty up so that clothes that fit her also fit me. I decided to go for option #3. If it worked, I’d have a dress form that was the right size. If it not, I’d still have options 1 and 2. Thankfully it did work, although she does still need a little bit of adjusting. The first thing to do is take some measurements. I then took Betty’s measurements. Her top half needed to be slimmed down a bit. The rest of it was fine, although the fact that she is not squashy is still a slight problem. 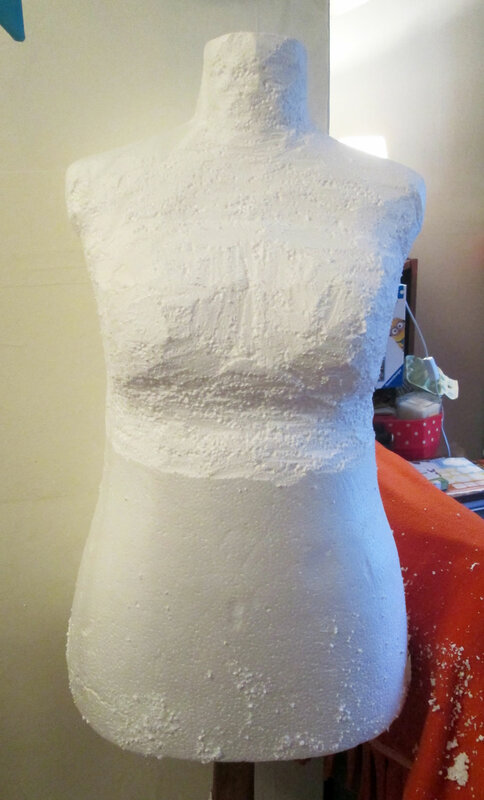 The cheaper dress forms are usually made of polystyrene and covered with a nylon cover. So remove the cover and find a sharp, serrated knife. As polystyrene makes an almighty mess, I’d recommend putting a tablecloth or a sheet down first. When I did this, it got everywhere. It even stuck to the cat. 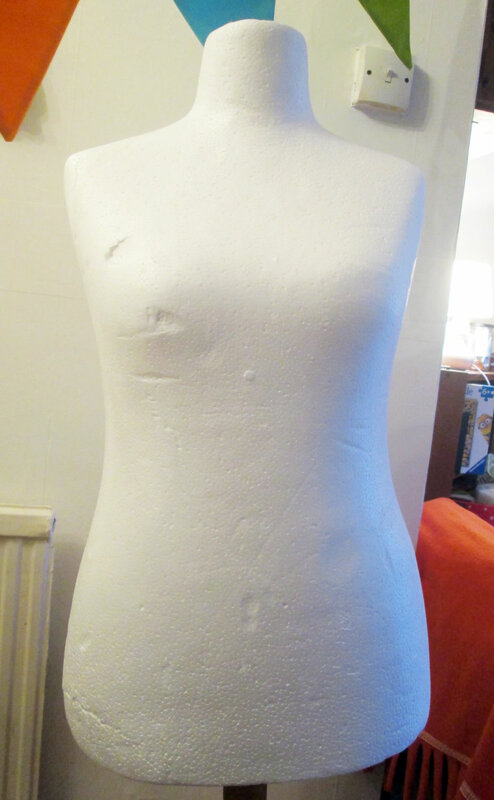 Identify the areas on the mannequin where your measurements are different. Using the knife, carefully shave bits of the dress form until the measurements correspond with your own. When you have got those areas to the correct size, then you can grade it between those points so that the dress form’s curves are similar to your own. Having a smaller frame than the dress form, I cut quite a bit of the underarm area and also off the back. Obviously cutting bits of it off only works if the dress form is too big. So what do you do if it’s too small (or if you accidently cut too much off)? In order to make your dress form bigger, you will need some firm batting or wadding, an old bra and an old top, either a snug fitting t shirt or a vest top. The kind they sell in Primark is just the thing. 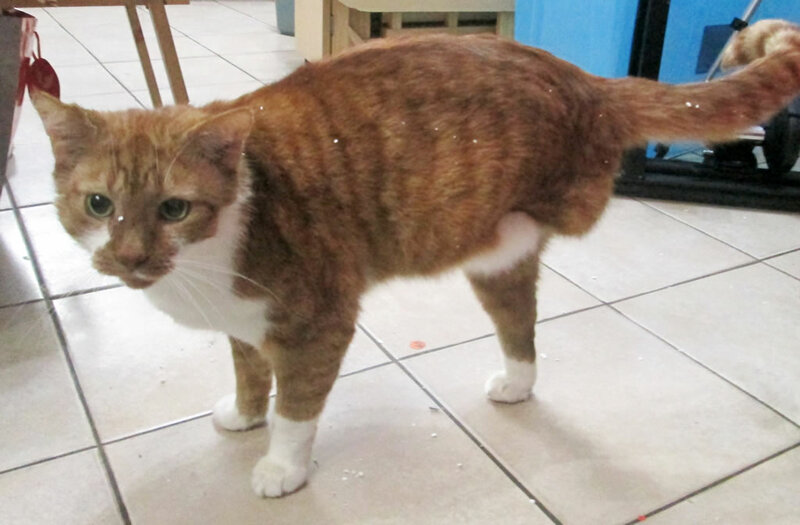 Identify the areas that need padding out. Start to layer up the wadding and pin it in place. Pop the t shirt onto the dress form and check the measurements. Keep going like this until you have a dress form that fits! 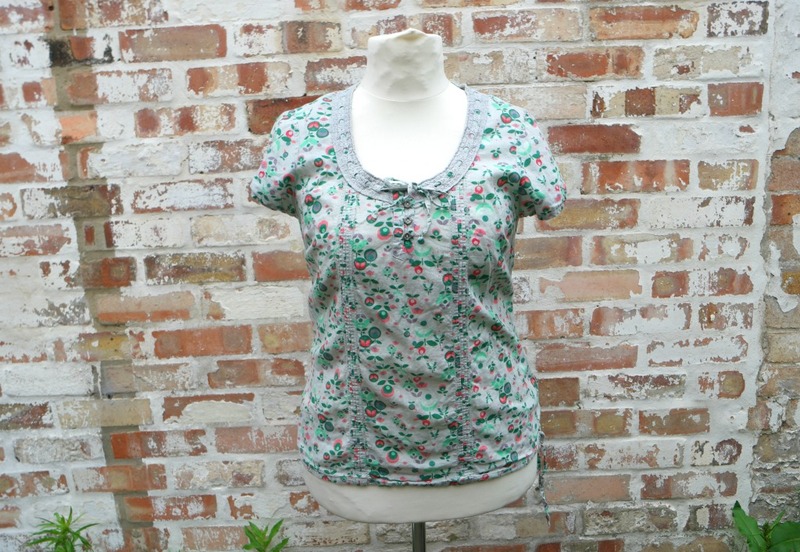 There’s a nice tutorial showing how to do this in more detail at Sew Country Chick.